Jim Hall's Chaparrals were the most innovative sports racers of the mid-late 1970s. They dominated the USRRC in the mid 1960s and provided excitement and technical innovation during the early years of the CAN-AM until regulated out of sports car racing. His early Chaparral 2 cars were first aluminum tub and later fiberglass with a super-secret GM automatic transmission that Jim Hall still refuses to talk about 40 years after the fact! He introduced the movable rear spoiler to American sports car racing in 1965 and that led to a greater interest in aerodynamics as it applied to automobiles. Ever needing to keep ahead of the competition, his cars were rarely exactly the same from race to race. Hall would be continually developing the cars to improve their performance in some way or another. It isn't surprising to find out that he only actually had 8 total chassis built over the entire run of Chaparral sports racers. These were all developed into later cars. For instance, chassis 2A002 was a 2A, 2D and 2F while chassis 2C001 was a 2C, 2E and 2G! In the annals of sports car racing the name Jim Hall and Chaparral will continue to spark interest and speculation. Unlike some more recent kits, this one has a full resin body and chassis. The resin is something I've seen before in French aircraft short run kits. A slightly rough, pink material that in the aircraft kits has proven to be rather brittle. The moldings themselves are really well done. I was pleased to note that the resin pour stubs had been removed leaving only very small areas to sand down. No bubbles or broken bits were visible. The mold seams are quite small and only a touch of resin flash was evident. The other resin part is the seat which has a rather shallowly molded seat belt on it. Tires are rather pliable rubber so it will be interesting to see how long they hold out before cracking. Two vacuformed windscreens are provided, for which I am quite grateful as the vac plastic is quite thin. Small brass rivets are provided for the injector stacks and while not quite prototypical, are quite convincing and better than any pewter molded bits. 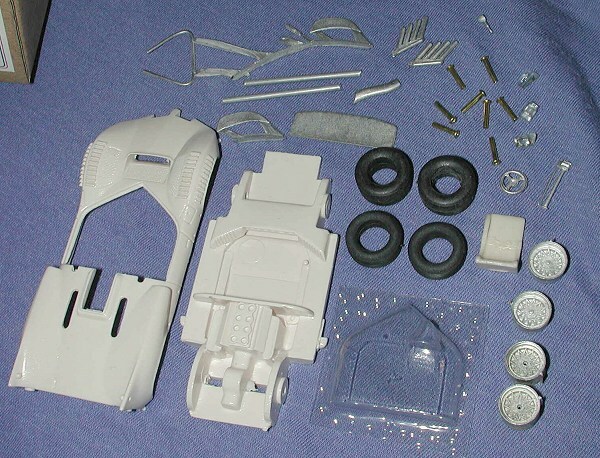 The rest of the kit is in pewter and that includes the rear spoiler, front spoilers, wheels, exhaust stacks, front cooling scoop, roll bar, steering wheel and rear jack point. There is no separate instrument panel, that being molded into the upper body as nothing more than some circular indentations. The front headlights are in what appear to be clear resin. My kit had an extra, which is nice as I usually lose little things like that. Instructions are a basic exploded drawing with color information in both French and English. Frankly, there is little else to add as the car is white overall with a black interior. Though I seem to recall the lower body pan being a brown from my slot car racing days! In photos it appears to be a flat black. Whether that extends to the entire underside of the car is unknown. The decal sheet seems to be a generic Chaparral sheet with the usual numbers and sponsor logos. It appears to be slightly off register and some of the decals (such as the Cox one) are a bit odd-looking, but they should work just fine. Now for the accuracy deal. This kit is supposed to represent the car as it was run at Las Vegas in November 1965 and judging from the reference, it is. By that time, the 2As had been brought up to full 2C bodywork configuration with the adjustable rear spoiler. The cars had louvers a-plenty on the forward fenders and none on the rear as was the case with the later 2A bodywork. For those who are wondering how one can tell a modified 2A car from the real 2C, there are two big clues. One is that the 2A has a roll bar that extends behind both seats instead of just the driver as in the 2C. Second, the 2C had no louvers and was a much cleaner car. Other small bits were that the wing actuating arm was on the center in the 2C and to the left side on the 2A. Later 2Cs had the exhaust exit from the rear of the car. The 2C also had a taller intake manifold and shorter velocity stacks. Yeah, more info than you wanted to know but there it is. This kit does accurately portray the Las Vegas car. Were I to make any changes to the kit body, I'd sand down the fender louvers as they are a bit much. Though I would personally have liked the car to be molded in a bit better resin, only building will tell if it will provide any problems.